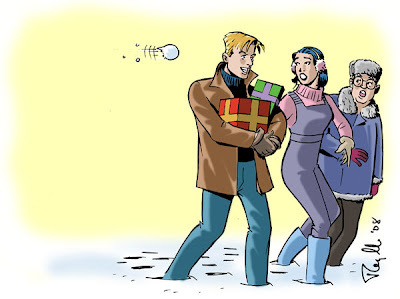 It’s a tribute to the artist’s enormous influence and talent that Noel Sickles, who worked exclusively as a cartoonist only from about 1933 to 1936, continues to be remembered and honored in the comics industry. 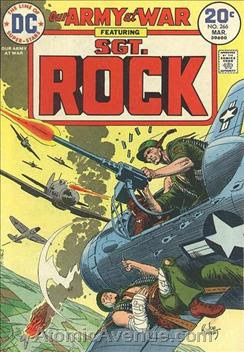 Along with cartoonist Milton Caniff, creator of Terry and the Pirates and Steve Canyon, Sickles in his brief time in the industry is credited with creating and subsequently inspiring a whole new style of cartooning—often referred to as the “chiaroscuro school”—which used heavy blacks to create a sense of dramatic mood and atmosphere, as well as a documentary effect, on the comics page. 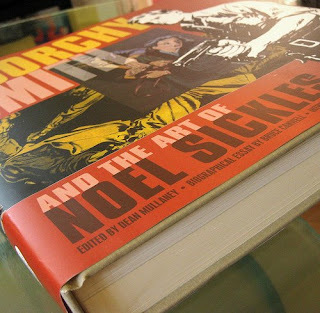 Further cementing his legacy is a hefty, comprehensive, and beautifully designed oversized artbook devoted to the artist, Scorchy Smith and the Art of Noel Sickles, by Dean Mullaney. 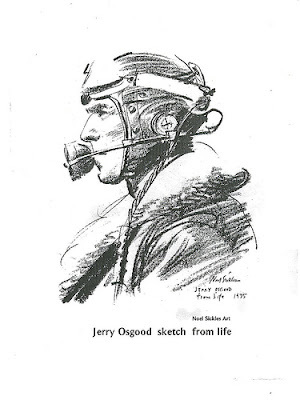 Reportedly begun as vehicle to reprint the artist’s full run on Scorchy Smith—an aviation/soldier of fortune daily adventure comic strip inspired by Charles Lindbergh—the labor of love soon evolved into a serious retrospective into the artist’s life and career. While Sickles would regardless always have been remembered for his pioneering work, his place in comics history was partly ensured by Caniff (who I’ve blogged and written about extensively: see here and here). Both from Ohio, the two young men met at the start of their careers at the Ohio Dispatch newspaper art bullpen (both attended Ohio State simultaneously for a time) and soon became close personal friends as well as studio mates. Caniff was a skilled networker and self-promoter, but generous as well. Indeed, in the midst of the Depression, it was Caniff who found Sickles a job at the Associated Press shortly after he had been hired there, which eventually led to Sickles’ assignment on Scorchy Smith. But Caniff never hesitated to credit Sickles for inventing the style that Caniff subsequently picked up, developed further and turned into his signature style. Sickles partly developed the style to speed up production on Scorchy Smith since it allowed him to slap down blacks very quickly. But he also did so out of boredom and experimentation. 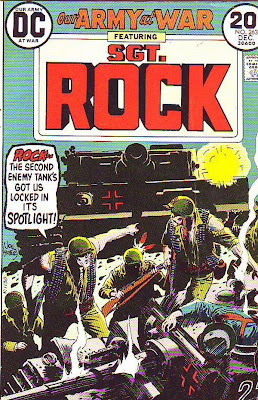 Like another Sickles/Caniff disciple, Alex Toth, Sickles was notoriously restless, as well as incredibly versatile. (Like Toth, Sickles was an "artist's artist.") Storywriting Smith never really held much interest for him; Caniff often scripted the strip in advance for him while Sickles occasionally lent a hand on his studio partner’s strips. But even in his short time on his strip, you can see Sickles using a whole range of styles, from the chiaroscuro look to one with heavy cross hatching. Given this restlessness, it seemed inevitable that Sickles would move on. And indeed he did, becoming a successful and respected commercial illustrator, which Mullaney’s book covers comprehensively. 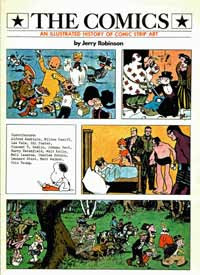 Sickles’ cartooning background, however, clearly continued to serve him well. A review of his work in the new biography shows that his art never looked artificial or labored, but rather incredibly spontaneous and naturalistic. And each piece always told a story—indeed, most of his work seemed to be for fiction pieces or were presented as reportage, rather than classic commercial illustration. 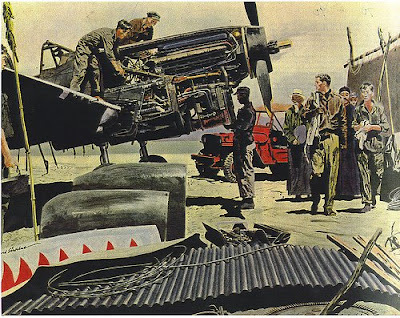 Credits: Many of the images featured here from Scorchy Smith and the Art of Noel Sickles are from commercial artist Leif Peng’s “Today’s Inspiration” blog. Leif has posted extensive samples of Sickles’s work featured in the book here. I’ve always been a sucker for classic Bond films, as well as films and music that capture the spirit of the early Space Age '60s era. Tipped off by a capsule review in Entertainment Weekly, last May I had the pleasure to discover such a film, from France no less, entitled, OSS 117: Le Caire Nid d’Espion (Cairo, Nest of Spies) at a local upscale arthouse movie theater (the Landmark in Los Angeles). The official site for the film can be found here. The film is scheduled for release at the end of this month—above is the films' trailer. As one can see from the teaser, OSS 117 is essentially a Bond parody film—in French of course— set in 1955, that authentically captures the genre and era very convincingly down to the credit sequence, the music, the cinematography, art direction, costuming, and primitive special effects, such as rear projection during driving sequences. 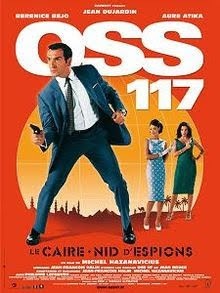 Apparently, OSS 117 is based on a series of novels, that were made into actual spy films in France during the 1950s and ‘60s (predating Ian Fleming's Bond books! ), but here it’s been updated as a comedic parody of the genre. While the film isn’t quite as polished as your standard Hollywood fare, I enjoyed OSS 117 quite a bit, and found it very funny. I sometimes found myself on the verge of tears laughing. It helps, of course, that I watched the film with a receptive audience at an art house movie theater that provided a laugh track for much of the film. The title character, whose codename is OSS 117 (the character's given name is Hubert Bonisseur de La Bath), is not quite as clueless as Maxwell Smart or Inspector Clouseau (though he's close), and the movie is played just slightly straighter and less-over-the top than those films. The film is definitely more authentic-looking than the Austin Powers movie, and less self-conscious or self-referential. Some of the humor in the movie stems from the lead character being ignorant of Middle East culture and religion, so he keeps inadvertantly insulting Arabs throughout the film. As this suggests, the archaic views of Western colonialism from the era are played up for laughs. As an example, at the end of the movie when the case ends, OSS 117 predicts that the Middle East will now enjoy peace for centuries. But there also is plenty of lowbrow and double entendre humor. The film is helped by a terrific cast, particularly lead actor Jean Dujardin, who apparently is a well known comedian in France. Dujardin manages to capture much of Sean Connery’s early 007 look and signature moves very well. While I'm not sure everyone will get the joke, if you're comfortable with foreign films and enjoy the "space age" design of the '60s (as seen in TV shows like Mad Men and films like Catch Me If You Can), you may get a kick out of this. I was attending UCLA in 1983 when American Flagg! debuted. 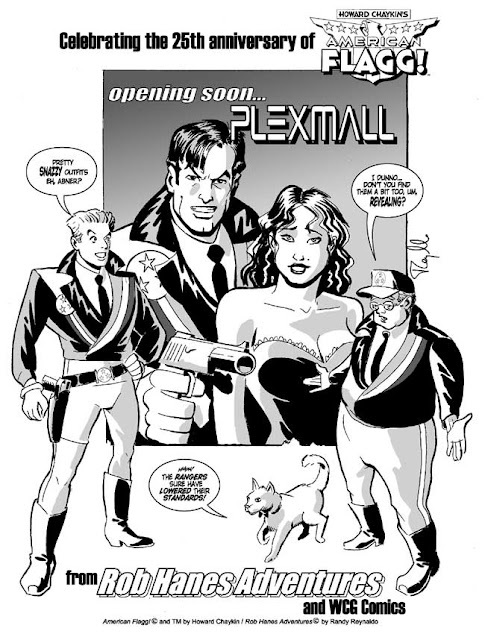 While I can’t recall specifically what comics I was reading at the time, aside from some early black and white titles that signaled the start of the independent comics movement like Cerebus, Elfquest, and Love and Rockets, there wasn’t much in the mainstream that I can recall particularly inspired me, though I had discovered the direct market just a few years earlier. 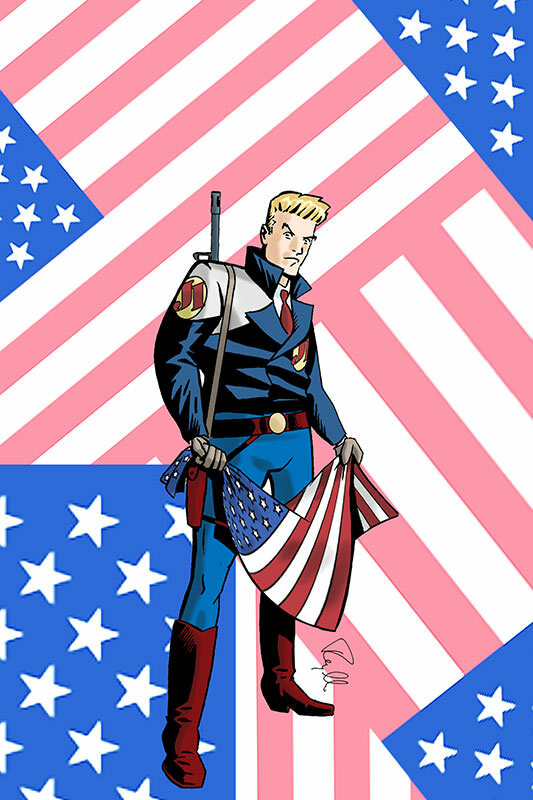 Then along came Howard Chaykin’s American Flagg! This year marks its 25th anniversary. It’s probably the single series which reignited my passion for comics and which showed me that comics like my own that did not solely feature superheroes in tights were a viable alternative in the new direct comics market. Of course, like all great comics, while the concept and story were outstanding, the art brought it to a whole new level. 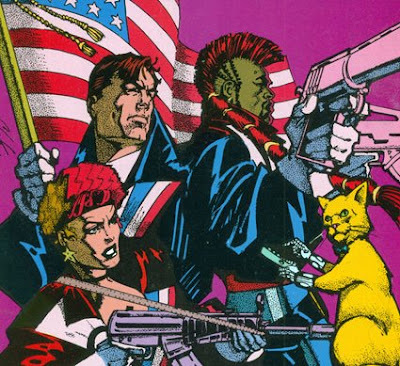 With Flagg, Chaykin’s strong sense of design came to the forefront, punctuated by his effective use of Duoshade. 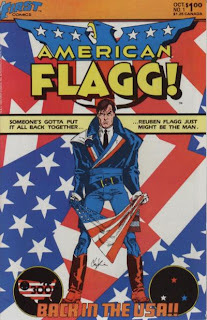 Flagg was a comic-book series that I eagerly anticipated each month, and one for a long time I continually pored over for both study and inspiration. 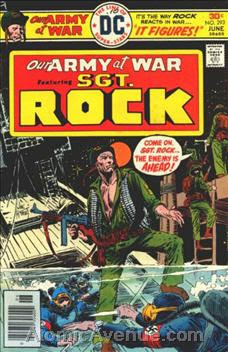 Though the series continued for several more years after the first 12-issue story arc, Chaykin—never one to linger and always with his eye on the next project—eventually lost interest in the series and at different times during its history turned it over to other artists and writers. For the most part, my interest gradually cooled in the series as well. 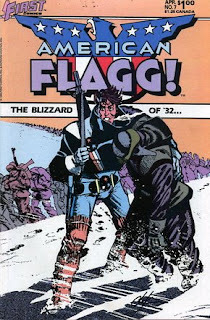 Nevertheless, in its first few years, Flagg completely reinvented the form for me showing how much more could be done in monthly comic-book format. 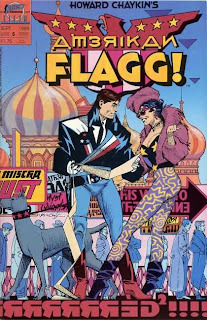 Flagg still brings back terrific memories of my college days and of an exciting and inspiring time to be part of comics. One of my favorite films in recent years is Hot Fuzz, directed by Edgar Wright and starring Simon Pegg and Nick Frost, who also were involved with another cult-favorite effort, Shaun of the Dead. Though I knew Hot Fuzz was a parody of high-octane Hollywood buddy cop films, because of my preconception of it as an English movie (and mind you, foreign movies are a fairly regular staple of my movie-going diet), I was nevertheless completely taken by surprise by how slick and sophisticated a production it was, as well as funny. Discovering brilliant gems like this is what makes movie-going so worthwhile. 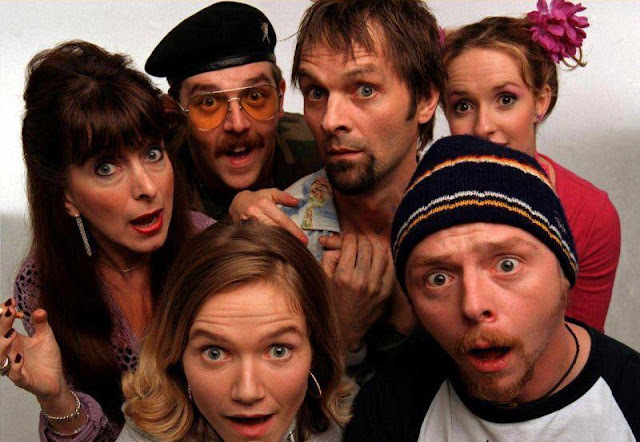 Just released in a deluxe DVD package is the BBC television series Spaced, an early project on which Wright, Pegg and Frost first worked together. The series played for two seasons, for a total of 14 episodes, in 1999 and 2001, and was the brainchild of Wright, Pegg and fellow actor Jessica Hynes, who also stars in the show. Pegg and Hymes play Tim and Daisy, two slacker types who meet in the first episode after each having just ended their respective relationships. Tim is a struggling comic-book artist and Daisy is a wannabe writer/journalist. In need of fresh starts, they find an affordable flat to rent together as roommates but only can do so by posing as couple. 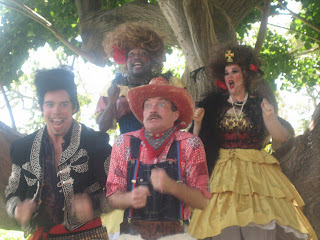 The core cast of characters—eccentrics all, in the best English tradition—includes their heavy-drinking divorcee landlady, Marsha; Mike, Tim’s best friend from childhood, who is obsessed with guns and playing army (played by Frost in his very first acting job); Twist, Daisy’s best friend, a fashion plate; and Brian, the tortured artist who rents another flat in the house. The show is heavy on pop culture references and incredibly self-referential, containing homages and references as varied as the Star Wars films, the Shining (and all matter of horror films), the Matrix, Grease, One Flew Over the Cuckoo’s Nest, the A-Team, and the films of John Woo. Along with its hilarious quick cuts, fantasy sequences and flashbacks, you can clearly see the beginnings of the style that would evolve into Hot Fuzz. While much of the comedy are in the characters themselves, what also distinguishes the show's work is the way it uses the conventions of genre films and direct visual homages of pop culture to heighten and punctuate the humor. Much like a DVD Easter egg, these pop culture references add another layer of subtext and hilarity to the show. Like Hot Fuzz though, the show’s comedy and heightened reality never predominate the show or the characters: the filmmakers and the actors clearly worked to create recognizable people and situations that audiences genuinely care about. 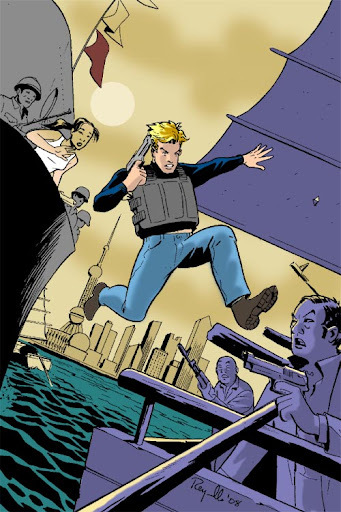 Taking advantage of the truncated British television season format, the series creates a genuinely heartfelt story and character arc within the two 7-episode seasons—much of the tension of the show is built around the complex relationship between Tim and Daisy, and the question of whether or not their relationship will go to the next level. It’s a remarkably well-done balancing act the way that the show can simultaneously feel emotionally grounded yet veer into near-surreal moments as well. The bottom line, however, is that the show is laugh-aloud funny, and flies its geek flag proudly. 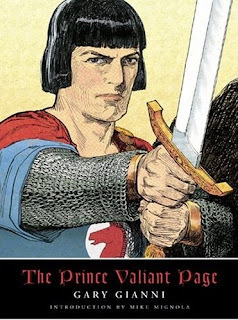 As a fan of classic comics, I’m very familiar with Hal Foster’s Prince Valiant and Foster’s enormous talent as an illustrator and his attention to detail. 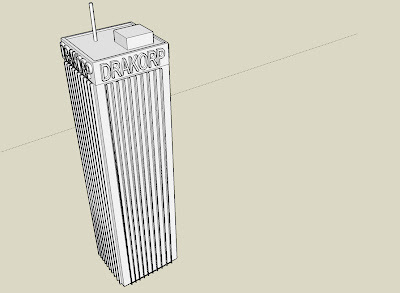 However, I never read the strip much—it wasn’t carried by any newspapers I read and I’ve never made an effort to pick up any of the reprints because of my focus on other strips. While I was completely unaware that another artist had succeeded Murphy (himself a well respected comic strip artist), the samples of Gianni’s work in the book impressed me enough that I ended up picking it up instead of the Raymond book. Perhaps because I found the book so compelling I was surprised how quickly I read it—but there are plenty of wonderful examples of Gianni’s work (roughs, original art, printed pieces, etc.) to pore over. 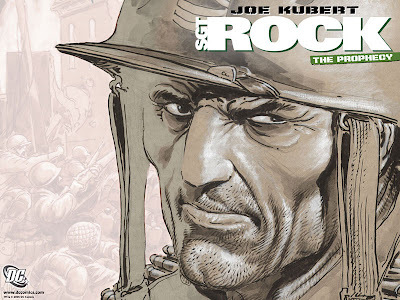 This is a great book for any fan of Valiant or illustration in general, and certainly for aspiring artists. 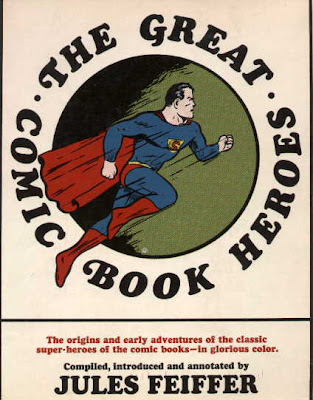 Until recently, beginning with the original Superman starring Christopher Reeve, and continuing through the Spider-Man franchise and this summer’s Iron Man and Hulk movies, superhero film adaptations focused on serving up to audiences—and comic-book fans— faithful live-action recreations of their favorite comic-book characters. The franchises and their concepts usually drove these films, and getting it “right” was the primary goal. After several mis-fires and re-boots (reaching a new nadir with the ‘90s series of Batman films), Hollywood has finally shown it has both the technology and respect for the material to make superhero adaptations that are entertaining and faithful to the source material. The Dark Knight takes this natural progression to a new level. Moreso than any with previous superhero film adaptation, in the Dark Knight, director and co-writer Christopher takes his audience to a new place by taking an existing superhero character to explore complex themes and ideas that go beyond the franchise. Though Nolan has been rather oblique about the message of the Dark Knight (he has acknowledged it can partly be seen as a commentary on the blowback the U.S. has experienced in recent years due to its foreign policy escapades), one of the issues the film addresses—which the characters in the film explicitly raise themselves—is whether the Batman (Christian Bale) is a cure or a symptom. While the Batman’s intentions to serve as his city’s guardian are honorable, in the film his presence and methods seemingly make things worse by ratcheting up the violence, inspiring copycats who get in the line of fire, and attracting new levels of villainy, as embodied by the Joker. As a result there are plenty of casualties in the film, many of them innocent victims. And at various points, the Batman’s faithful lieutenants—his valet Alfred (Michael Caine) and his technology guru Lucious Fox (Morgan Freeman)—openly question the Batman’s tactics and whether he may be partly to blame for what has occurred. Without giving too much away, regardless of whether he’s to blame or not, or indeed making a different (the film ultimately doesn’t answer this question), it’s telling that, at the end of the film, the Batman literally and symbolically assumes full responsibility for what has transpired. And like the archetypal Western, after having cleanses the city, he leaves town a hunted man, alone. Like Batman Begins, this re-boot’s first installment, the Batman and his story arc are central to the Dark Knight. And although the secondary cast and, particularly, the villains are strong and colorful, unlike the previous Batman series, they never threaten to overshadow the film, and they always serve to advance the film’s main story and central themes. Heath Ledger’s performance as the Joker has justifiably received universal acclaim (and is nicely analyzed here), so there’s no need for me to add to to the praise. But it needs to be noted that Ledger (and Nolan) have done an extraordinary job in successfully re-imagining such an iconic figure. The Joker in this film is faithful to the very chilling first appearances of the character in the 1930s and his more recent re-inventions in graphic novels like Alan Moore and Brian Bolland’s “The Killing Joke,” while also being completely new and fresh. It will be interesting to see how Ledger’s interpretation filters down to the comic book series. Morgan Freeman, Michael Caine, Gary Oldman (Jim Gordon), and especially Maggie Gyllenhall (Rachel Dawes) and Aaron Eckhard (Harvey Dent/Two Face) all are given meaty roles even if they have limited screentime. And one should not overlook the fine performance of Christian Bale in the lead role, who inhabits the character with great respect, conviction and vulnerability. It’s probably too early to call the Dark Knight the “best comic book movie ever”—certainly not with Watchmen on the horizon in 2009— but it’s among the most ambitious, mature and sophisticated. Plus, the increasing sophistication and varied textures of superhero films—ranging from summer popcorn flicks like the Spider-Man films and Iron Man to now darker fare like Dark Knight and Watchmen—doesn’t easily lend itself anymore to judging these movies with the same broad measure. Regardless, with the Dark Knight’s complex storyline and multiple rich character arcs, and the reviews that have acknowledged the film’s ambition, the superhero film has truly grown up. One final comment: I had the fortune to see it in Imax format. Six scenes were filmed in the oversize, crystal-clear Imax filmstock. When the Imax sequences initiate, the film takes up the entire Imax screen, then reverts back afterwards. It is quite impressive, without being distracting or taking you out of the movie. My report and photogallery on the 2008 San Diego Comic-Con International are now online. I've just returned from this year's San Diego Comic-Con International, and it was another crowded and frenzied affair! 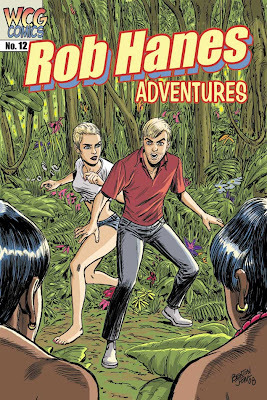 I met plenty of fans both old and new, and sold a lot of back issues and copies of my newest issue, Rob Hanes Adventures #11. I have little time to report anything substantive, other than to say that this show will no doubt be seen as another huge monster success, in terms of the number of attendees and the frenzied coverage it will receive. As always, many comic-book companies and entertainment companies have waited for the Comic-Con to make many major announcements. It's only Friday and I already feel tapped—and tomorrow is Saturday, traditionally the busiest and craziest day of the convention! The other big news—though peripherally related to the convention—was the closure of the Interstate 5 freeway into San Diego on the first day of the show (Thursday, July 25), due to a car accident that occurred at 5 a.m. People I spoke with who drove in to the show from various points in L.A. got stuck in their cars for 5 to 7 hours, compared to the 2 it took me to drive down early Wednesay morning. My wife and children usually come down Thursday—a day after me—but this year they fortunately came down Wednesday afternoon and saved themselves a lot of grief and frustration. Anyway, below are some preliminary pics from the show (you can click on them to see them full-size and in more detail). but I just had to take a pic of this pair who came as Indy Jr. and Sr.
Traffic at the convention center at 8 in the morning, hours before the doors officially open! Ready for another busy day! 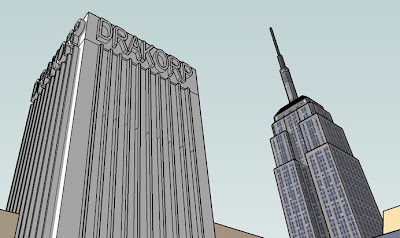 Geekdom's biggest party begins July 24 and WCG Comics will be there for its 11th appearance as an official exhibitor (and something like the 25th+ time as a member of the hoi polloi). 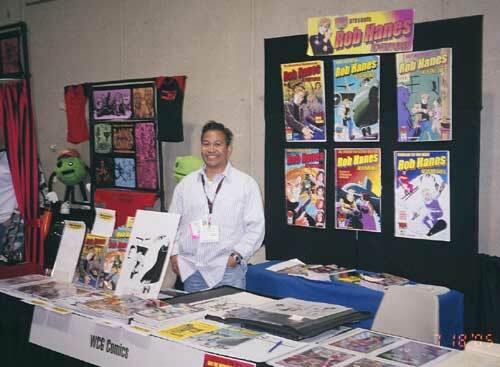 In cased you've missed my stab at a stealth campaign about my appearance, you'll find the WCG Comics booth among the sea of exhibitors in Booth S14 in the Small Press Pavilion on the main convention floor (off of Aisle 1400, Exhibition Hall B1/B2, against the west wall). 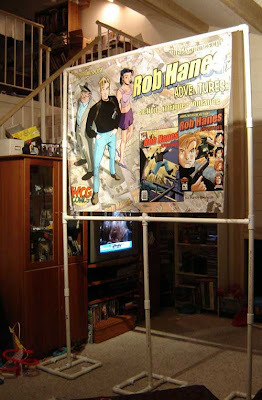 Come by and say hi, hang out, meet my family, pick up the latest issue of Rob Hanes Adventures, and find out what's up next for the House of WCG. If you can't make it, check back, I may be able to post a blog or two from the convention. I'll definitely have my usual report with photos after the show! 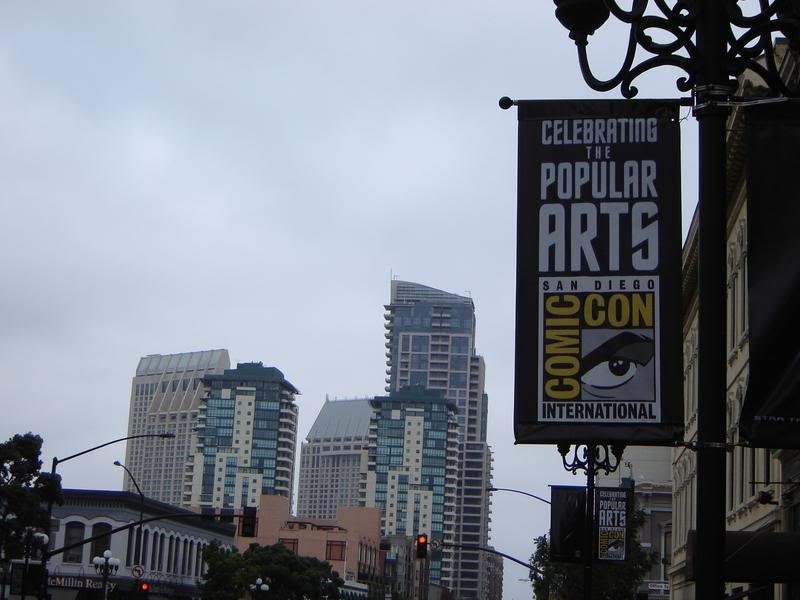 Every year the organizers of the San Diego Comic-Con International invite people to submit art and articles for the show’s program focused on any of the various theme’s of that year’s show. The themes are usually connected to the anniversary of some character or series. 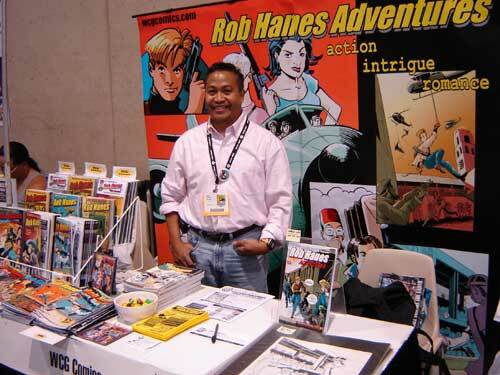 I’ve always enjoyed submitting these contributions which, in the best comics tradition, I have used as an opportunity to crossover my own character, Rob Hanes, with other features. I like to think the Comic-Con people enjoy them too since my art often gets nicely featured in the final program. As the San Diego Comic-Con has gotten bigger, one of the big impacts has been the spillover into the local area. It is now notoriously difficult to get a hotel room in the area at convention time, and rooms are priced in line with demand. Similarly, since the San Diego convention center feeds into the trendy Gaslamp District, the local area restaurants are packed at dinnertime right after the show closes each evening. As such, over the years, I’ve discovered a few “tricks” of avoiding long lines at eateries. First off, of course, avoid the Gaslamp’s main drag on 5th Street at all costs. For the unimaginative, the bars and upscale restaurants immediately draw the crowds and long waits. Yes, there are good restaurants and I guess it’s fun to “see and be seen,” but there are also plenty of terrific restaurants just one block over. Even better, take a short cab ride up to Little Italy where it's even less crowded and there are many great restaurants. Finally, if you're not in a rush to get home and want to avoid traffic going out of San Diego if you drove, I found it's worth it to grab some dinner before you hit the road on the Sunday evening after the show has ended. It gives you time to relax and decompress before the drive home, and the restaurants are less hectic and, in fact, pretty dead—that’s when I usually hit a restaurant on the Gaslamp! My friends and I used to have the tradition of meeting for dinner on the drive home at Anderson's Split Pea a little north of San Diego in Carlsbad, but unfortunately that closed years ago, to be replaced by a TGIFs. Which just isn’t the same I’m afraid. I have a confession to make: if I was not exhibiting at the San Diego Comic-Con International, I probably would skip it this year. Except for the year 2000 when I was married and on my honeymoon, I have attended every convention dating back to the mid-1980s—and since the early '90s I have attended as a professional and/or exhibitor. Attending the convention is exhausting enough as it is, imagine what it's like to work it. I could use the break! As I've said many times at my Comic-Con reports of previous years, the show is an exercise in sensory overload. 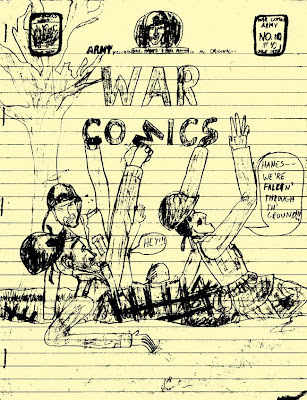 The main draw for many attendees nowadays seems to be simply to be able to say they were there, rather than for the comics—the spectacle of the event itself, rather than the content, seems to have become a major appeal of the show. In keeping with the rise of geek culture, the Comic-Con has transcended comics and become a pop culture show. It needs to be said, though, that while some traditionalists decry this shift, I don't think there's anything inherently wrong with that—there are still plenty of traditional "old school" comic-book conventions, so it's fine to have a show like Comic-Con that is a real raise-the-roof party for all things geek. But since this show happens to be the one in my own backyard, and the one where I have established myself as a regular, it's the one I must attend each year. But I do occasionally long for the days when it was a bit more laid back and less crazy. This is my roundabout way of providing this blog entry's main tip for attending the Comic-Con: Don't expect to attend the convention and see "everything"! Given the signings, celebrity appearances, panels, movies, movie previews, comics, etc.—and the crowds and the lines for many of these events—it's simply not possible. There was a time (even after I started exhibiting) when I could methodically and casually go up and down each aisle over the course of a show to check out all the exhibitors and their wares. No more—the crowds in some areas are so thick that I sometimes don't even bother some areas, meaning that the crowd flow often tends to dictate foot traffic. As a result, I often lose track of where I've been on the floor. The show has become an amalgamation of a wide range of discreet interests. While there's some overlap, for the most part it's easy to attend the show and stay safely esconced within that bubble. For example, there are some people who simply scope out a seat in the large presentation screening room that seats nearly 5000 people (which otherwise is very difficult to get into) and stay there all day sitting through one movie preview and celebrity appearance after another. There are the fans who are there just for the toys; or the videogames; the anime; the manga; to meet their artists and writers; to get autographs; to attend panels; to show their portfolio; to watch the round-the-clock sf and animated film screenings; to dress up; and to take photos of hot chicks and people in costumes. (Oh, yeah, there also are plenty of comics too.) I know people who take a day off to go to Seaworld, Legoland, or even Disneyland in order to take a break from the craziness! So as soon as you arrive, look through your program guide—it's your bible—then plan your day accordingly. Sure, you can mix it up, but don't go in without a clear plan other than to see "everything"! As mentioned in my previous blog, I decided to create a new banner for my booth, which I had printed at Sugar House Banners (which I am happy to recommend). It looks like I'm good to go!